Jerry Berrigan, left, and his brother the Rev. Daniel Berrigan, right, with Sister Elizabeth McAlister in 1972 in Harrisburg, Pa. Credit United Press International. Jerry Berrigan, the legendary Catholic educator and political activist, passed away this past July at 95. Alongside his brothers Philip and Daniel, both priests, he helped implement national strikes against American involvement in Vietnam and in 1973 was arrested for holding a prayer protest against the U.S. bombing of Cambodia. Further arrests followed as he protested nuclear proliferation, the Iraq war, and, most recently, drone attacks at Hancock Field Air National Guard Base in 2011. Berrigan’s commitment to his faith and political activism was inspired by his Catholicism and Syracuse upbringing. Jerome Berrigan was born December 20, 1919 in Ely, Minnesota. His family later relocated to Syracuse, New York, where his father worked as a community organizer and his mother taught him the power of faith, sending him to Catholic high school. Berrigan fought in WWII and served mass for Padre Pio in Sicily, who would later be canonized as a saint for bearing the stigmata. Jerry tried studying for the priesthood, but realized his vocation was teaching and social activism. In the 1950s, he was one of the early followers of the Catholic Worker tradition in Syracuse, founded by Dorothy Day with whom he remained friends. In the 1960s, he marched alongside Martin Luther King, Jr. in Selma. In an interview for Syracuse.com right before his death, Berrigan said his faith means “always remaining open,” a mantra he stuck to throughout his long life. In addition to his brother Daniel, Berrigan is survived by his wife of 61 years, Carol, his three children, and five grandchildren. Michael McCourt, a legend in the San Francisco bar scene for nearly 50 years and younger brother to the late Frank McCourt, died this September following a stroke and a battle with cancer, surrounded by his family. He is survived by his wife, Joan, their three daughters and one son, and his brothers Malachy and Alphie. He was 79, but hadn’t accepted retirement yet. Despite ailing health and a recent fall, McCourt still came in to his regular twice-weekly lunch shifts at Original Joe’s, the North Beach tavern where he had worked since 2012, getting paid to simply sit and sip a Guinness – he was that important to the atmosphere of the bar. 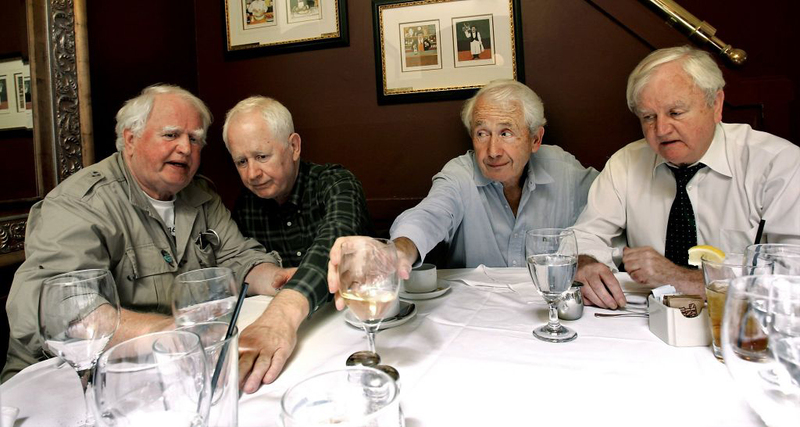 In this 2004 photo, four McCourt brothers sit together at the Washington Square Bar & Grill in San Francisco. From left to right: Malachy McCourt, Alphie McCourt, Frank McCourt, and Michael McCourt. “He could keep a bar going because people liked to listen to him talk. He could charm anybody,” Mike Fraser, who had worked with McCourt for more than 40 years around San Francisco, including Original Joe’s, told The San Francisco Gate. Born February 24, 1936 in Limerick, McCourt was one of seven impoverished children, as documented by his brother Frank’s memoir Angela’s Ashes, though only one of four who survived past the age of three. At 18, he came to the U.S. and served a four-year tour in the Air Force before coming to New York and joining his older brother Malachy working bars. But Michael soon moved west, eventually rubbing shoulders with and counting among his friends the likes of John Wayne, Lee Marvin, and Neville Brand. Renowned physician and psychiatrist Dr. Garrett O’Connor, the founding president of the Betty Ford Institute for Prevention, Research and Education in Addictive Disease who was lauded for his life-long work on addiction treatment, died early September at his home in Aughrim, Co. Wicklow. Dr. O’Connor was born April 15, 1937 in Dublin and graduated as a physician from the Royal College of Surgeons and later Johns Hopkins in Baltimore. His career was marked by a devotion to expanding psychiatric services, developing novel treatment methods for addiction, as well as studying the role of cultural malignant shame in the development of addiction among the Irish. He was also highly dedicated to the communities he served, no matter where he lived. During the 1967 Baltimore riots following the assassination of Martin Luther King, Jr., Dr. O’Connor was instrumental in opening channels between East Baltimore community leaders, the National Guard command, the Baltimore police department, and the then-besieged Johns Hopkins Hospital, earning him a commendation from the Mayor of Baltimore. In 1972, Dr. O’Connor met and married the actress Fionnula Flanagan and the two moved to Los Angeles, where he served as Associate Professor of Psychiatry-in-Residence at UCLA for more than 30 years before joining Betty Ford. Dr. O’Connor had been in recovery from alcoholism since March 6, 1977, and was widely known for using his own life story as a tool for teaching about recovery to patients, medical students, and other audiences, including his fellow physicians, and was recently included among the 2015 Irish America Healthcare and Life Sciences 50 honorees. 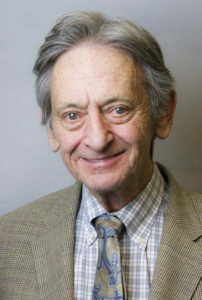 In addition to his wife, Dr. O’Connor is survived by his two sons, Matthew and Turlough, his daughter Mary Lee-Woolf, two daughters-in-law, seven grandchildren, and two great-grandchildren.